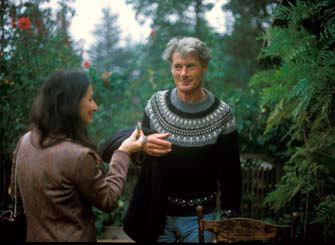 When we interviewed Skip Kimura in 2012, he described to us that his first encounter with Alan Chadwick occurred at the 1976 Berkeley conference that presented talks by Paolo Soleri and Alan Chadwick. He commented that Soleri spoke in a meek voice that could hardly be heard by the audience, and how that contrasted with Chadwick, who filled the auditorium with the presence of his professional theatrical voice. Skip decided then and there to travel up to Covelo and to enroll himself in the apprenticeship program that had been established at that garden. The article that follows is a review of that event in Berkeley, which was published in the Berkeley Barb, one of the first "alternative newspapers" that sprang up in the United States during the 1960's. 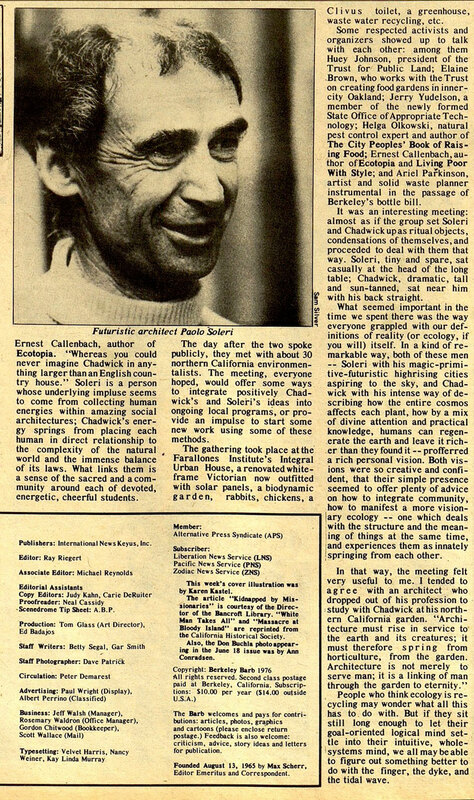 Laughingbird, the author of the article, also wrote another piece for the Berkeley Barb and one for the New Age Journal on the subject of Alan Chadwick and his gardens.